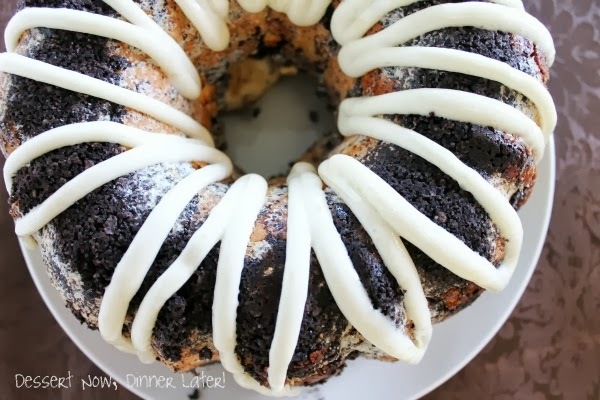 Cookies & Cream Monkey Bread - Dessert Now, Dinner Later! 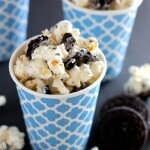 Oh boy do I have the recipe for you today! 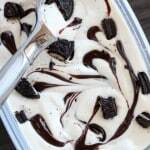 Cookies & cream anything is a favorite combination of mine. 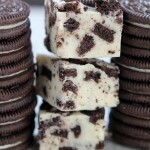 Just check out my Cookies & Cream Magic Bars or Cookies & Cream Rice Krispies. 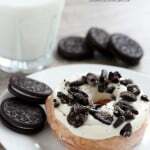 This combo goes well in any dessert! 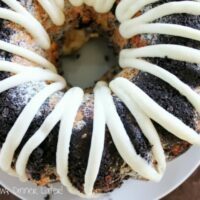 Today I am sharing my recipe for Cookies & Cream Monkey Bread over on the Rhodes Bake-N-Serv Blog. 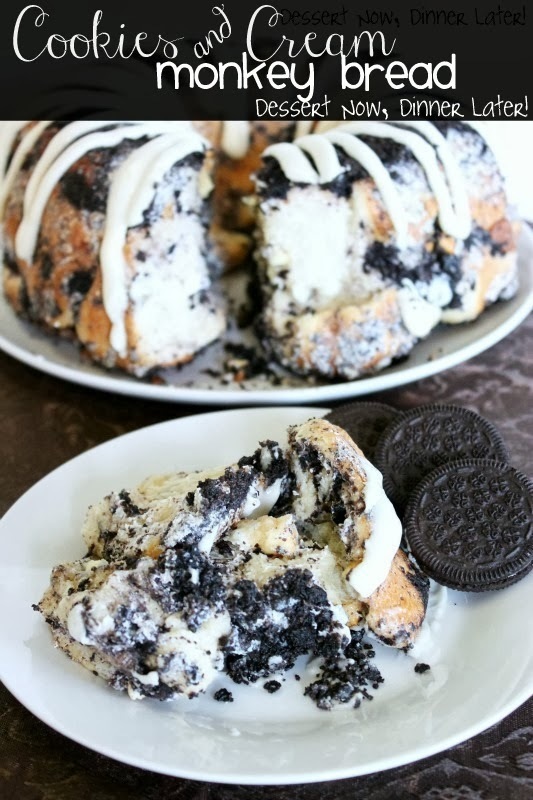 The bread is soft, the cookies are crunchy, the white chocolate chips are melty & top all that with a drizzle of cream cheese icing – PURE HEAVEN! Recipe added 5/25/16. For a step-by-step photo tutorial, visit the Rhodes Bake-N-Serv Blog. Thoroughly spray the inside of a bundt pan. Sprinkle ⅓ of the crushed cookies on the bottom. Cut each roll in half & coat in the butter. Place half of the remaining crushed cookies into your dry pudding mix. Stir it up. Then dredge each buttery dinner roll piece into the pudding & cookie mixture. Repeat process with the other half of the rolls, & top with the remaining cookie crumbs & white chocolate chips. Spray a piece of plastic wrap & cover the pan. Allow to rise until double in size or it reaches the top of the pan. Bake at 350 for 25-35 minutes until the bread is browned. For the cream cheese icing: blend 3 oz cream cheese, 2 tablespoons butter, ⅔ cup powdered sugar, ¼ tsp vanilla & 1-3 tablespoons milk (depending on desired consistency.) 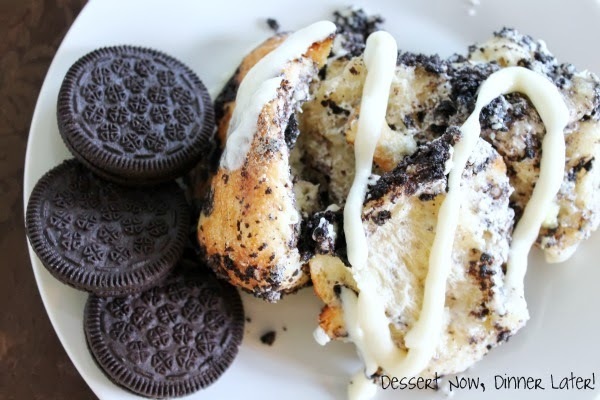 Put icing in a plastic bag, cut off the corner & decorate the top of the warm monkey bread. Looks so good! Pinning to try later!